With an estimated 80 to 90% of the world’s freshwater aquarium fish being commercially raised or aquacultured, it’s easy to overlook the fact that for the remaining 10-20%, someone somewhere had to go out and catch each fish before they can make their way into a home aquarium. With a few notable exceptions, the collection of wild fish for the aquarium trade remains poorly documented and understood. Even for someone like myself with a background in the trade, it was often difficult to develop a clear picture of the mechanics and logistics of wild fish collection. That said, one of the major goals for my travels throughout Southeast Asia was to visit with collectors and document this process wherever possible. My first opportunity to do so came about when the exporter I visited in Bangkok was able to arrange for me to go out with some of his collectors about two hours to the northeast of the city. Despite the fact that right now, at the beginning of the monsoon season, is not typically a good time for the collection of wild fish, this collector dealt with low volume and less seasonal species that could be collected throughout the year. 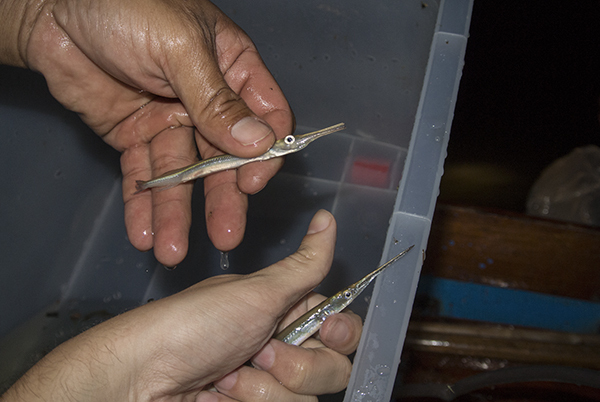 Our target was the needlefish or Asian gar (Xenentodon sp. ), a somewhat popular predatory aquarium fish that is exclusively collected from the wild. We would go out after dusk to collect at night, but aside from these few details I had no idea what to expect. Traveling in Asia tends to make one far more accepting of situations where you get into a pickup truck or tuk tuk with a complete stranger to travel to a vaguely described destination, so the next day my wife and I met up at the exporter’s facility inside the city and did just that. We met the collector who was to be our guide for the next day and unfortunately, as my (limited) Thai language skills were slow to come back after five years of disuse, we faced a pretty challenging language barrier for the rest of our time together. We were traveling to the province of Prachinburi, a primarily rice farming region at the foot of the Sankamphaeng mountains. Closer to our destination, we crossed over the Bang Pakong river, one of the major watersheds in the area. It was a fairly typical river system for Southeast Asia—turbid, nutrient-rich water so full of sediment as to appear an impenetrably milky brown. 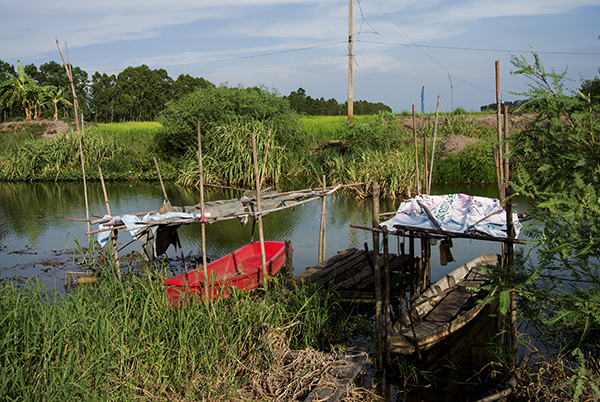 After stopping to inspect a local fisherman’s catch (food fish, primarily large Silurid catfish), we drove on past the rice fields and farmhouses. It turned out that our collector was a rice farmer as well, and likely uses the collection of aquarium fish to supplement the often-meager income from farming. After arriving at our final stop—a small irrigation canal draining from the Bang Pakong—we halted for a while to await the sunset. 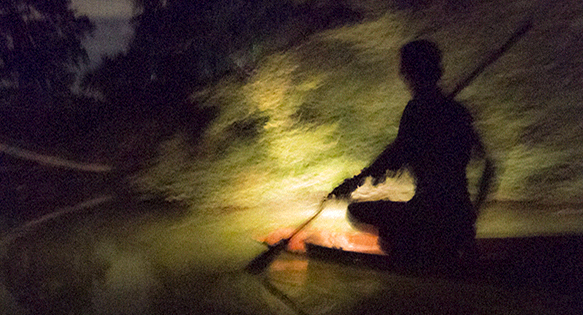 The gear was simple: a long handled net, two re-purposed headlights hooked up to tractor batteries, and 2 small canoes. My first overall impression was that this was not too far off from how collectors in Florida still go out after true gar (Osteiformes) for the aquarium trade. 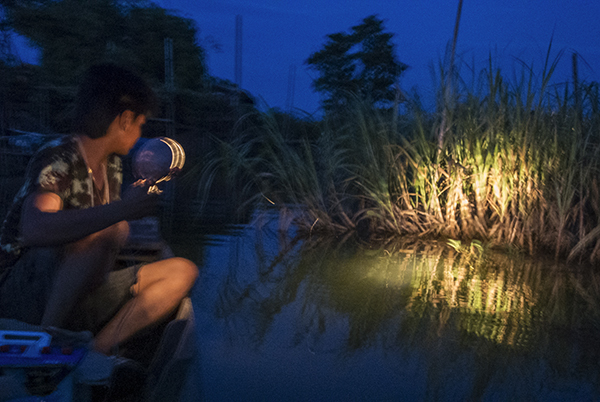 An aquarium fisherman scans the riverbank for needlefish. During the next 45 minutes or so, we spotted and collected around 10 needlefish with the hand net and headlamp, depositing them in a rubbermaid container. I was told this was a below average yield for a night of collecting, and that on a good night of collecting each scoop of the net would land 3 to 5 needlefish. This served as a good reminder with regards to availability of fish sourced from the wild—sometimes, the fish just aren’t there. After a certain point, we decided not to spend more time collecting, and we headed back to the riverbank. Once there, I was surprised yet again to the collector produce a small O2 tank from under his seat. He proceeded to fill a full-box fishbag with canal water, dump in the needlefish (adding a handful of salt he had brought along) then filled it with O2 before deftly tying the top with a rubber band. This was a real surprise, as I had rarely witnessed that level of sophistication in packing with fish collectors. 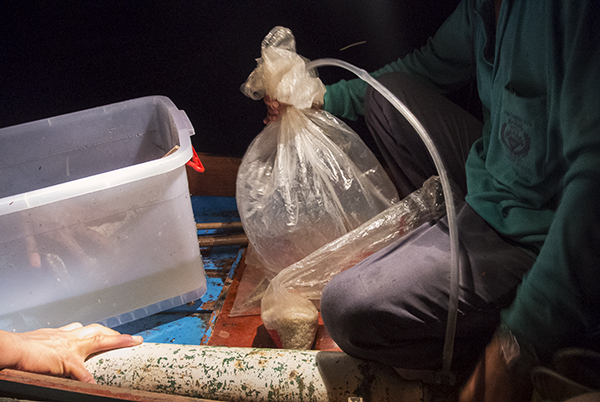 That small step of adding salt and using pure O2 to package the fish for transit to Bangkok can make a world of difference in terms of the condition the fish arrive in and their long term survivability. Needlefish (Xenentodon sp.) are often presumed to be a brackish water fish, yet those bound for the aquarium trade are being collected from pure freshwater, miles inland. The same is true with common archerfish (Toxotes jaculatrix), which are collected from the same waters. After a late dinner with the collectors, we spent the night in what I can only describe as a Thai version of a roadside motel or truck stop before catching a bus back to Bangkok the next morning. Although a bit exhausted from the long day, I couldn’t help but feel privileged to have had the chance, once again, to observe ornamental fish collectors in action. Difficult to arrange and challenging to undertake, experiences like this one will continue to prove important as they can shed a little light on the sometimes obscure origins of the fish we keep and enjoy in our aquariums and improve our understanding of not only our fishes’ habitat in the wild but also the lives of the people involved in the first links in the global supply chain for aquarium fish. As we move closer to the peak collecting season, expect more updates from the field as I visit freshwater and marine collectors throughout Southeast Asia. In the mean time, I’ll be traveling to Laos and Cambodia (two countries which do not currently export ornamental fish) seeking out ornamental fish species in their natural habitat wherever possible. The author would like to express his gratitude to the exporter in Bangkok who was instrumental in arranging this trip and sharing his wealth of knowledge on the trade in Thailand. Great job, Mike! Enjoyed the read. Can’t wait to hear about your next adventure. Great article. Reminds me of my reading of the adventures of Herbert Axelrod is TFH. and some of my collecting trips in Florida. Great article Mike. Very informative. Great job, Mike! Enjoyed the read. Can't wait to hear about your next adventure.